A single Hubble Space Telescope image can capture scores of distant galaxies, but the one galaxy we'll never see from the outside is our own. As a result, no one knows the Milky Way's exact size and shape. It took more than a century after the discovery of the first spiral in space before astronomers established that our Galaxy is a spiral, too, and more years elapsed before they deduced that we inhabit a barred spiral—a type whose bright central region is elongated. Now, for the first time, observers have detected five stars on the far side of the Galaxy that serve as outstanding yardsticks, a feat which will divulge secrets about the Milky Way's terra incognita. "It's a beautiful piece of classic astronomy," says Leo Blitz, an astronomer at the University of California, Berkeley, who was not involved in the discovery. The researchers, in South Africa and Japan, discovered five stars known as Cepheids shining on the opposite side of the Milky Way's disk, 72,000 to 99,000 light-years from Earth. All five stars lie behind the Galactic center, which is in the constellation Sagittarius about 27,000 light-years from us. Cepheids have starred in numerous astronomical breakthroughs because they reveal a crucial quantity: celestial distance. A Cepheid is a yellow supergiant—a star as warm as the Sun but much more luminous—that periodically pulsates, expanding and contracting so that its light waxes and wanes. Just as a tuba resonates at a lower frequency and deeper pitch than the trumpet it dwarfs, so a large and luminous Cepheid takes longer to pulsate than a smaller, dimmer Cepheid. Thus, merely measuring a Cepheid's pulsation period indicates how much light the star emits. Comparing this luminosity with how bright the Cepheid looks reveals its distance from Earth—the farther the star, the fainter it appears. The Cepheids' location initially suggested they had come from the nearby Sagittarius dwarf galaxy, which the Milky Way's gravity is tearing apart. "We were quite surprised to find that these [stars] didn't have the right velocities for that," says Michael Feast, an astronomer at the University of Cape Town. Using the Southern African Large Telescope (SALT) the astronomers measured the stars' Doppler shifts at infrared wavelengths, which penetrate dust in the Galaxy's disk. The velocities derived from the Doppler shifts indicated that all five Cepheids belong to our Galaxy. The astronomers report their discovery in the May 15, 2014, issue of Nature. The stars are well above and below the Galactic plane. Cepheids are always fairly young—born less than 130 million years ago—and young stars normally reside within just a few hundred light-years of the Galactic plane. The five far-off Cepheids are 2,900 to 6,800 light-years above or below the plane, suggesting that the far side of the Milky Way's stellar disk is flared, like the wide end of a trumpet. This finding makes sense, however, because interstellar gas, which produces young stars, is also flared on the Galaxy's outskirts. "It's exciting to see these young objects way over there," says Thomas Dame of the Harvard–Smithsonian Center for Astrophysics, not involved with the study, who uses radio waves from molecular gas to map spiral arms as their gas gives birth to new stars. "Ninety percent of what we know about the spiral structure of the Galaxy comes from our side. We don't know much at all about the other side." 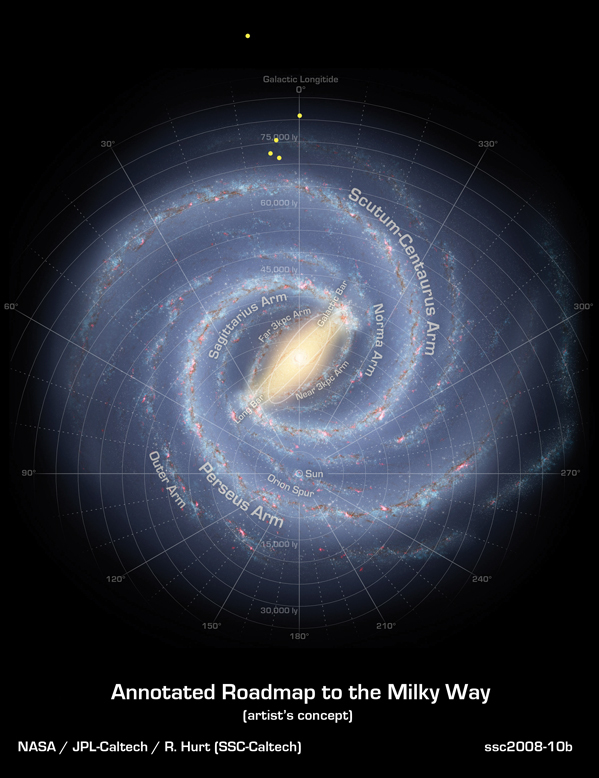 In 2011 Dame and his colleague Patrick Thaddeus traced a great spiral arm named Scutum–Centaurus across the Milky Way's far side, finding that the spiral arm rises several thousand light-years above the Galactic plane there. Unfortunately, unlike Cepheids, these radio observations yield only crude distances, and Dame says the spiral map here may be as flawed as the maps navigators used during the age of Columbus. He notes that three of the Cepheids have similar positions, which suggests to him that they lie in the mighty Scutum–Centaurus Arm; but their distances place them beyond its location on the map, so the Scutum–Centaurus Arm may actually lie farther away than originally estimated. One Cepheid even shines beyond the edge of the stellar disk, hinting at another remote spiral feature on the Galaxy's far side. What's needed to resolve these matters? More Cepheids. "Five is a miserable few," Feast laments. But he says their discovery "opens up the possibility that big surveys, especially in the infrared, will throw up more stars like this and allow one to really investigate the structure of the Galaxy out at these distances." In another decade we should have a better view of our galactic home.